The rare Markhor Goat has been hunted to near-extinction in the last century. 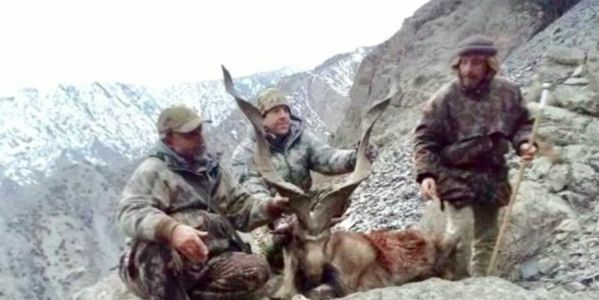 Recently, an American trophy hunter proudly posted a disgusting photo of a murdered Markhor Goat in Pakistan. The hunter, Christopher, reportedly "earned" the right to kill this threatened animal by paying the most money — $100,000 (£78,000). But no amount of money should allow a greedy American to kill a threatened animal for pure sport. Only 6000 Markhor Goats still exist and not only are they they a protected species in India, but the beautiful creature is also Pakistan's national animal. After decades of dedicated conservation programs, Pakistan has now started granting hunting permits under the "trophy hunting" blanket. Trophy hunting has been proved to not be an efficient conservation tool in those countries with high rates of corruption and even higher levels of poverty — it is simply impossible to keep the flow of money under control and the ones that lose are the animals, as usual. In this case, the threatened Makhor goats are the ones who are losing — they are losing their oldest and strongest males, the ones with the biggest horns that selfish trophy hunters yearn for. This sets a very dangerous precedent for all other endangered and protected species in Pakistan and neighbouring countries, and involves everyone and every natural environment. What will be next, trophy hunting tiger cubs? Should years and years of conservation efforts be thrown to the wind for a need to kill? We think not. Should a country let people with money kill a species that has already run the risk of being wiped out? We think not. Tell Pakistan: stop trophy hunting now!